The launch of Chicago Shakespeare’s 2013-14 season corresponds with the release of Chicago Shakespeare Theater: Suiting the Action to the Word, a collection of original essays by nationally and internationally recognized scholars, critics and artists that examines Chicago Shakespeare’s unique approach to Shakespeare’s canon. Compiled and edited by CST Scholar-in-Residence Regina Buccola and Valparaiso University Dean and Professor of Literature and Humanities Peter Kanelos, the collection offers varied perspectives on the many interpretations of Shakespeare that CST has produced in the last 25 years. As the scholarship of Shakespeare’s works continues its trend to shift away from a strict study and analysis of what is on the page, to also include the interpretation of the performance itself, the production history of CST offers a rich opportunity for scholarship. “For those of us who do performance studies work, if I am a mad scientist, then this theater is my laboratory; that’s where I learn things about these plays that are new,” said Buccola. Bringing together professional and scholarly examinations of CST’s productions and programming, the book champions that “Chicago Shakespeare has brought new audiences to Shakespeare, invigorated audiences who had become settled in their expectations, provoked reflection, generated debate, and challenged orthodoxies, all while presenting on its stages work that has garnered worldwide acclaim.” By spanning a full spectrum of thought on theater-making at Chicago Shakespeare, the collection further serves to document the state of Shakespeare in America today. Published by Northern Illinois University Press, Chicago Shakespeare Theater: Suiting the Action to the Word is available for purchase at the Theater during performances for $30 (with a 10% discount for season subscribers and educators). 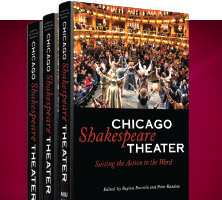 Chicago Shakespeare Theater: Suiting the Action to the Word is edited by Regina Buccola, CST Scholar-in-Residence and associate professor of English, Roosevelt University and Peter Kanelos, dean of Christ College and associate professor of Literature and the Humanities, Valparaiso University. The collection features contributions from (in alphabetical order): Jonathan Abarbanel, theater critic for Chicago Public Radio; Michael Billington, the longest-serving theater critic in the history of The Guardian; Simon Callow, British actor and director of stage, screen, television, and radio renown; Gina M. Di Salvo, Northwestern University; Wendy Doniger, Professor at the University of Chicago; Jeffrey Gore, University of Illinois at Chicago; Bradley Greenburg, Northeastern Illinois University in Chicago; Clark Hulse, University of Illinois at Chicago; Richard Ouzounian, chief theater critic for the Toronto Star and Canadian correspondent for Variety; NPR personality Peter Sagal; Michael Shapiro, Loyola University Chicago; Wall Street Journal drama critic Terry Teachout; Alicia Tomasian, William Rainey Harper College; Jonathan Walker, Portland State University and Wendy Wall, Professor of the Humanities at Northwestern University.